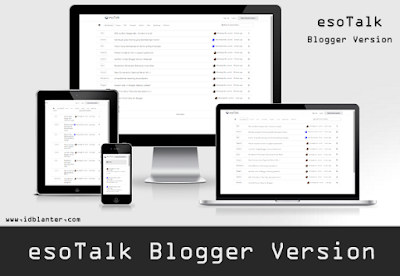 esoTalk now available for users blogger, blogger templates esoTalk version is cool, simple and similar to esoTalk for hosting. I made a version of this blogger because esoTalk theme is very simple and I understand the basic style. and be "esoTalk Blogger Version"
That is a pretty interesting theme you made. You know, I was thinking "what's so different about this theme"...and then I scrolled down. buat wordpress gan gimana? @DuniaBlanter ? @DewatiSuzana buat wordpress gan gimana? @DuniaBlanter ? buat wordpress belum saya buat..
Is this made for G5 esotalk? @Tech Is this made for G5 esotalk? This is a Blogger theme, and is most likely made with this forum as a modal. · Tech and [deleted] like this. great one here dude! can I embed this into my blog, without affecting my template -e.g, create this forum on a blank page. if so, how? @duniablanter, do you know when it can be available for wordpress? @Jarry @duniablanter, do you know when it can be available for wordpress? I do not know when this esotalk theme in wordpress, I am not good at wordpress ..
Oh! I really like it. Do you know how to maybe add it to another blogger page as my forum section of my blog? how to install it on esotalk? @Romzes how to install it on esotalk? This is for Blogger not esoTalk. @Jarry Oh! I really like it. Do you know how to maybe add it to another blogger page as my forum section of my blog? 1. Log in to your Blogger dashboard and go to Layout > Edit HTML. 2. Please back up your old template in case you decide to use it again. To do this, click on the "download full template" link and save the file.